The Modulate™ Magnetic Counter accents the Modulate line of mix and match banners and reconfigurable exhibit kits. 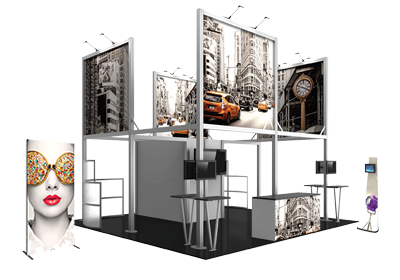 Couple Modulate banners with the Modulate Counter to create kiosks and workstations for use in tradeshow exhibits, at events and in more permanent settings. The Modulate Magnetic Counter comes with a magnetic, snap-button tube frame, an internal shelf, a printed stretch fabric graphic and a portable carry bag. The graphic spans the perimeter of the frame and attaches with hook and loop, making it easy to get inside the counter for what you need.